The Incredibly True Adventures of an EdTech Trailblazer: JCHS Poised to Set Hour of Code Record! JCHS Poised to Set Hour of Code Record! Cdn4.dogonews.com. N. p., 2016. Web. 29 Nov. 2016. On Wednesday, December 7, 2016, James Clemens High School is poised to set an Hour of Code record with its planned school-wide Hour of Code “unplugged” event to expose over 1800 students, teachers, and administrators to computer science. This event is part of a week long series of Hour of Code events showcasing why computer science matters in the lives of our students. Hour of Code activities start November 29, 2016 with a special Pilot's Lounge to train advisory teachers how to present the "unplugged" Hour of Code lesson to their students. In addition to the school wide "unplugged" Hour of Code event, other activities will take place throughout the week of December 5-9, 2016, including whole class coding activities customized to subject area content and an extra special teacher Reindeer Games celebration that will include Hour of Code and MakerSpace activities. Computers are everywhere, but fewer schools teach computer science than 10 years ago. Girls and students of color are severely underrepresented. The good news is James Clemens High School is changing this for the better. There are over 500,000 computing jobs open nationwide. Only 42,969 computer science students graduated into the workforce in the U.S. 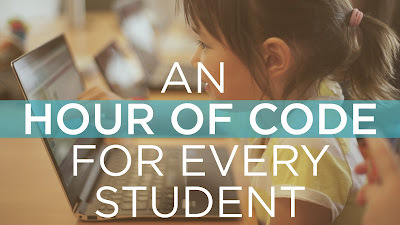 The Hour of Code is gateway toward providing all students with access to high-quality computer science education. Over 100 million students worldwide have already tried an Hour of Code in the past three years. Thanks to the Hour of Code, computer science can be found on the homepages of Google, MSN, Yahoo! and Disney. President Obama, Shakira and Ashton Kutcher have joined with over 100 partners to all kicked off the Hour of Code with videos to support this movement. For more information about how James Clemens High School will participate in Hour of Code events this school year, visit snap.vu/s1eq or contact Nikki D Robertson.